If you are like most students, the Reading sections of the ACT and the SAT are the most challenging aspect of the tests. So it's essential that you study with the most authoritative, comprehensive, and practical guide on the market: The PowerScore ACT and SAT Reading Bible. Most ACT and SAT prep books superficially cover all sections of a single test; they may address the Reading section in as few as 20 pages in order to accommodate Math, Writing, Science, and fabricated practice tests. 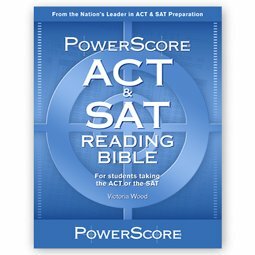 The PowerScore ACT and SAT Reading Bible, on the other hand, is a comprehensive guide that dedicates over 400 pages to helping students exclusively raise their Reading scores. Designed to assist the resolute student taking a single test or the multi-tasking test taker attempting both tests, this book thoroughly examines how the test makers assess reading fundamentals and teaches you how to target the right answers and avoid the wrong ones. You won't find another resource with more material or more definitive methods for improving ACT and SAT Reading scores.